LEGO conjures up such vivid memories of a childhood spent covering the living room floor with piles and piles of bricks, scouring endlessly for that one piece needed to finish off a particularly elaborate yet disproportionately sized racing car. No limits beyond the amount of bricks available could ever stop you from creating pretty much anything you wanted. Perhaps that’s why so many who played with Lego in their youth still hold this simple yet effective toy in such high regards. And yet while older, and embracing the far less physical art of video gaming, Lego has yet to recapture that child like wonderment in digital form quite as well. LEGO Universe would seem to come close, or at least it likes to tell you that. Imagination, it implies, is the commodity you use in it’s vibrantly colourful world to save it. You’re told from the get go that it’s through the power of your creative mind that wrongs can be righted and a dark and sinister force can be defeated. It’s your mind as well as you fist that can save the day. Often however, the execution pales compared to the lofty promises made. Breaking into a genre as crowded as the MMO is never an easy task, though Universe does at least attempt to do some things differently enough for it to stand out in a saturated crowd. It also has a story. Beginning with a group of adventurers scouring the universe for the power of creation, their task ends when they discover a world containing a vortex of imagination itself, where whatever you think can be made a reality. Things take a turn for the worse when one of the group attempts to use this power for his own nefarious ends and creates a dark force known as the Stromlings who quickly get out of control. The world is consumed in the process and fragmented into smaller floating islands. You jump into the fray as a new adventurer out to help bring some semblance of order to this chaos, and it’s through your ability to create with the Lego now strewn across the shattered world that you must fulfil this goal. It’s a simplistic narrative that does it’s job in giving you something to aim for, or at least give the illusion of such, but for the most part it gives a perfect excuse for things to be smashed along the way. And hitting things certainly seems to be the primary function you use the most in this adventure. Practically everything can be pulped into tiny Lego pieces, be it the roaming Stromlings often blocking your way to new areas or the innumerable inanimate objects littered through the lands. These each dispense money and bricks so regularly that rarely will you ever find yourself running low on the games most basic of resources. No need for auction houses or player driven economies here. But what of the actual building, the primary function of Lego? Powering everything in this game is your imagination bar. Think of it as Universes answer to Mana. Collecting Imagination orbs powers this bar up, collect enough and it can be used for a variety of tasks that often include turning random piles of scattered bricks into useful apparatus needed to access previously blocked off areas. It could perhaps be something simple such as building a bridge to cross a gap, or a jump pad to get to higher ground, maybe even turning the remains of a defeated robot into a friendly gun turret that targets nearby enemies. The con however, is that while you use your ‘Imagination’ to build these things, you do so to the specifications the developer has laid out. 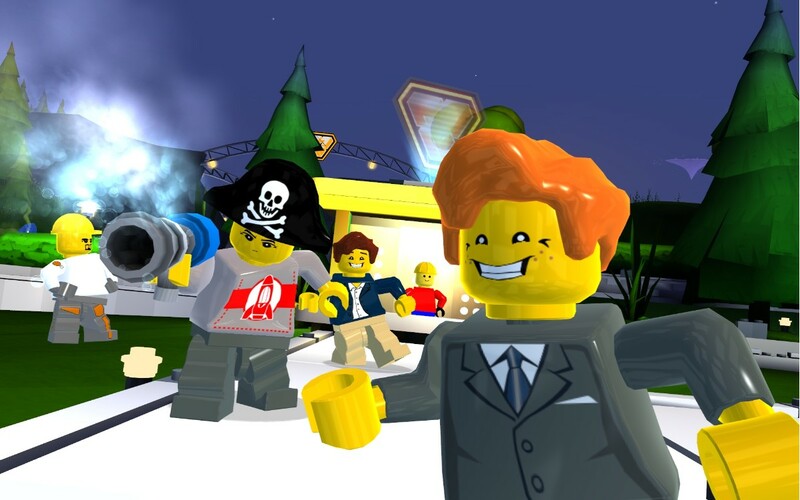 A quick tap of a button throws your avatar into an animation that sees objects being built in front of your eye’s, much as is the case with the Traveller’s Tales Lego games. You don’t however, get to build these objects yourself. Nor can you construct modes of transport with the freedom you often crave. Early in the game you’re given the opportunity to construct a rocket to travel between worlds. While a degree of freedom is offered, it’s still bound by some strict limitations. You can place only three separate model parts to build the craft, and while you can mix and match these pieces, you can’t add anything to them. No personalisation, no colour schemes, not one of the thousands of the bricks that are rewarded can be used as extra decoration; nothing. It’s all a little limited, at least if you stick to the core game. Venture outwards into the private properties and things open up just that little bit more. These are essentially personal virtual play-mats where all the bricks that the game chucks at you like a blocky tsunami can be put to some use. What you build is entirely up to you, there are very few limits in this area. The more basic of things that can be built include huge model sets, a castle, or house, even an airport, which have to be bought or collected as quest rewards separately, and can than subsequently be slotted into place piece by piece. But for the more creative, for those hankering for the days of yesteryear where digging through mountains of Lego to craft, well anything, the build mode really comes into it’s own. Every individual brick that gathers in your inventory can be coloured and placed wherever you want. It’s possible to build anything from vast monolithic mega-structures to super-sized vehicles. There’s even a chance to input more complex commands such as the ability the rotate or elevate objects, creating multi-storied buildings with their own working elevators. 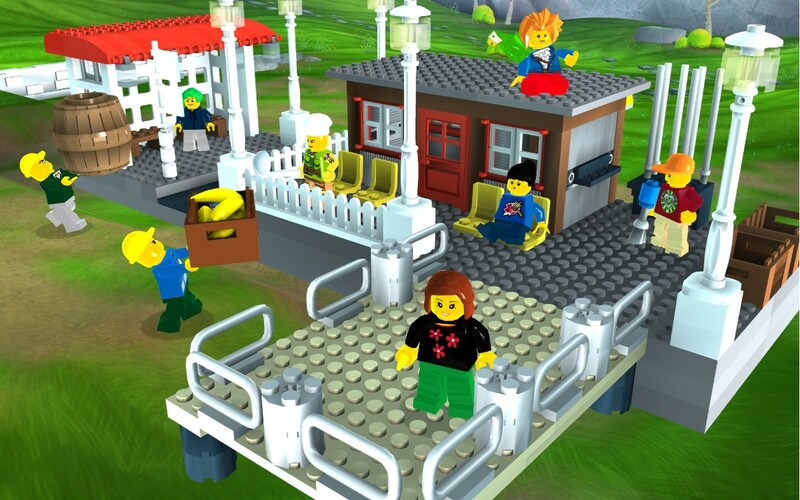 It’s an incredibly diverse building mode that’s about as close as any game has come in recreating that freedom to explore and craft with Lego. But you can’t show anyone what you create. Or to be more precise, you can’t take your creations into the game proper to show them off. People can visit your lots and you theirs, but without that ability to use what you create in the actual game, the build mode feels like a tacked on feature rather than an integral part of it. This could perhaps be blamed on Universe’s rather strict parental controls, scrutinising everything from naming processes to the suitability of the models built. It’s no secret that this is a game aimed at the younger generation, so everything is played safe, and simple. As a consequence of this, it’s also unfair to call it a true RPG. There are no levels to work through, no skills to purchase from trainers, no guilds, no raids and no dungeons. If the game claims to be of the MMO genre, than it’s one that teeters on the brink of it. As such progression is linear, with one set path funnelling you through each of the sparse zones from quest to quest. These in turn are easy to grasp and complete, with only the bare minimum of effort actually required (collect this, smash that and so on) there’s very little in the way of a plot to keep these encounters interesting, they seem to exist simply to give players something to do. With no levels to work through, achievements instead offer more challenges. Admittedly, nothing more strenuous than killing a set amount of Stromlings or exploring as much of the world as possible, but with a healthy set of rewards they do offer something more interesting, if no less dull, to do beyond the vanilla quests. But if it’s an end goal you need to work to in Universe, you may find yourself disappointed. About the only aspect of the game that can even be considered end game content lies with it’s four factions. These act as classes. Joining one awards certain abilities that can be used in or out of combat, though their main selling point is with the armour and weapon sets they sell. And it’s here the core of the game begins to unravel. There’s not a huge amount of content to Universe, in fact, it’s perhaps more accurate to compare it to a single player game with multiplayer overtones. There are only five lands to explore and each feel rather limited in their size. Some rather blatant tricks are pulled in an attempt to add weight to the game’s MMO status, the incessant backtracking involved with many of the quests being one of the more immediately obvious. But it’s with the factions that those thinly veiled senses of longevity begin to crumble. In order to upgrade through the three tier armour sets, you must first harvest faction points. These drop off defeated enemies, and not always that often. The catch is that newer armour and weapons can cost a fortune in both cash and faction points, meaning that in order to advance and tackle some of the harder enemies you need to succumb to that loathed MMO tradition of grinding. This boils Lego Universe’s game-play into a succession of endless, eventually tedious, battles simply to unlock better armour to engage in much more of the same. 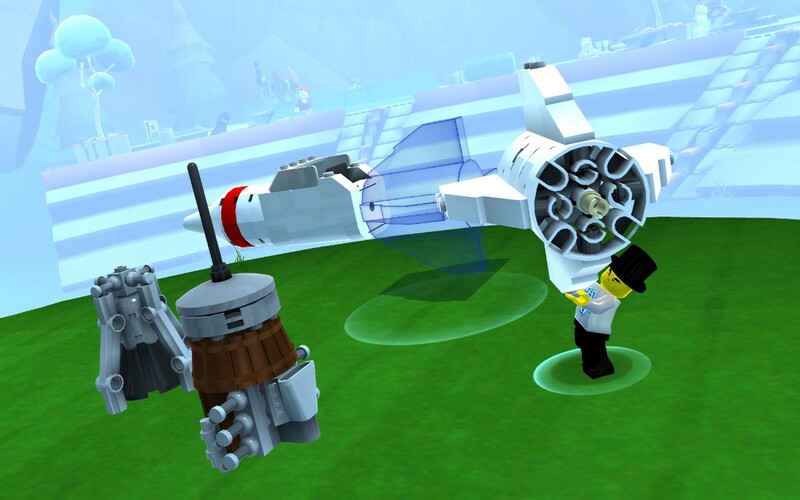 And yet, while it’d be easy for me to dismiss LEGO Universe as a failed venture, I still had fun with it. Limited in scope it may be, it’s still a joyful adventure that welcomes you in with a friendly hand and doesn’t pile on the kinds of pressures other games of this genre impose far less forgivingly. Some nicely varied mini-games are definitly welcome, be it the simple yet playable racing game or the sometimes quite difficult puzzles required to tame pets that see you attempting to build Lego models with the correct bricks. And while it can be a bore at times, questing through the game is never less than a pleasant, almost therapeutic experience. The graphics may not be to the standards of today’s high demanding machines, but together with a surprisingly professional soundtrack, they help ease you into the game with little fuss. And from someone who spends their MMO days primarily smashing undead hordes through high fantasy worlds, there’s a charm to LEGO Universe that just calms me even after a particularly bad day. But as an MMO, Universe struggles to justify it’s rather extortionate monthly fee. Had the game been free-to-play then the recommendation would be easy, but asking upwards of £7 a month is a little optimistic, especially as many will have experienced the bulk of what the game has to offer in the first free months play. New content is planned though, new islands are already on the way, and it’s a good thing too, as what Universe needs now more than anything is additional, worthwhile content. 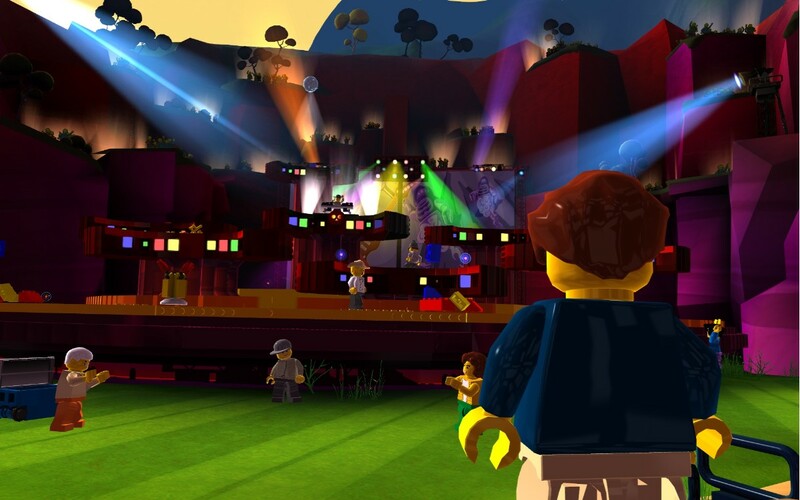 Whilst the youngsters may find the casual, no fuss pace of the game easy to get into and enjoy, and the older gamers find themselves enraptured with the impressive if sometimes clunky build mode, ultimately LEGO Universe suffers the same fate that many other Lego games have suffered in the past. It ending up feeling like a pale imitation of a toy you’d rather be playing with in the real world than in the digital one.